The other day I went sheep wrestling. No, this isn’t something city folks do for fun when they go out into the countryside — like cow tipping. My in-laws own 20 sheep. They breed them each year, sell the little lambs and start the process over the next year. In the meantime, the sheep grow wool. Well, you can imagine what wearing a fur coat in the summer heat is like. So, the sheep need to be sheared each summer. 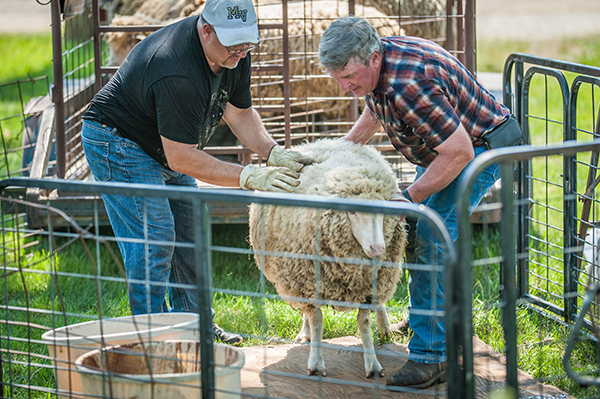 My father-in-law, Chuck Wood, is usually the sheep wrestler — the guy who grabs the sheep and takes them to the shearer. Well, the sheep don’t actually like being told where to go so they offer some (a lot) of resistance. So, it’s basically wrestling a 150-200-pound sheep over to a place she doesn’t want to go. This year, Chuck has been dealing with back issues, so I volunteered to take his place. It was an experience, to say the least. Let me first say that I’m not a big animal lover. I’m pretty sure that stems from when a big German Shepherd used me for a chew toy when I was five. I just don’t trust any animal not to do me bodily harm. So, I volunteered with some apprehension. Sheep have a reputation as gentle creatures. But I didn’t buy that for a second. Any animal that’s over 100 pounds has the ability to inflict pain, so I was cautious. Our first step in shearing sheep is to load them onto a trailer and drive them to a shady area so the shearer and the sheep don’t get too hot. With the temperature’s approaching 90 degrees, this was pretty important. Herding sheep is difficult. I now have great respect for that pig from the movie “Babe.” He herded sheep like a pro. Me, not so much. I’d get a few on the trailer and the second I turned my back they would jump off. It took three of us to get all 20 sheep on the trailer, although most sheep were on the trailer multiple times. Once we loaded the sheep and got them to a shady spot — in this case the front yard of an old farmhouse where my mother-in-law’s parents used to live — it was time to set up. The shearer was Jerry Truelove, a man in his late 50s who has been shearing sheep since he was a boy. This guy was a pro. I would grab a sheep, drag her off the trailer and Jerry would take over. He would flip the sheep on its back and then go to work. Sometimes, the sheep would offer resistance and Jerry would have to hold her tight until she calmed down. He took great care to make sure the sheep didn’t get too hot. If a sheep gets too agitated it could overheat and die. Thankfully, most of the time, though, the sheep just took it and let the man work. It was fascinating to watch Jerry work. He had everything down to a fine art, from flipping the sheep on her back to the actual shearing. It went quickly and smoothly. The world record for shearing a sheep is 37.9 seconds by Ivan Scott of Ireland. Jerry doesn’t work that fast, but he’s not exactly slow either. There aren’t many people around who shear sheep, so Jerry keeps busy. He owns several hundred sheep, as does his father. And he shears them all. He can do as many as 50 a day, but it’s a long exhausting day. Being part of this process was extremely gratifying. I’m an office drone. I work at my desk on a computer all day. Being out in the elements was refreshing and a reminder of all the different jobs that people do from all walks of life. We need businessmen. We need lawyers. We need journalists. We need trash collectors. We need life guards. We need everybody to make society work. And we need sheep shearers. Heck, I’m thinking if this journalism thing doesn’t work out, I can always be a sheep wrestler.